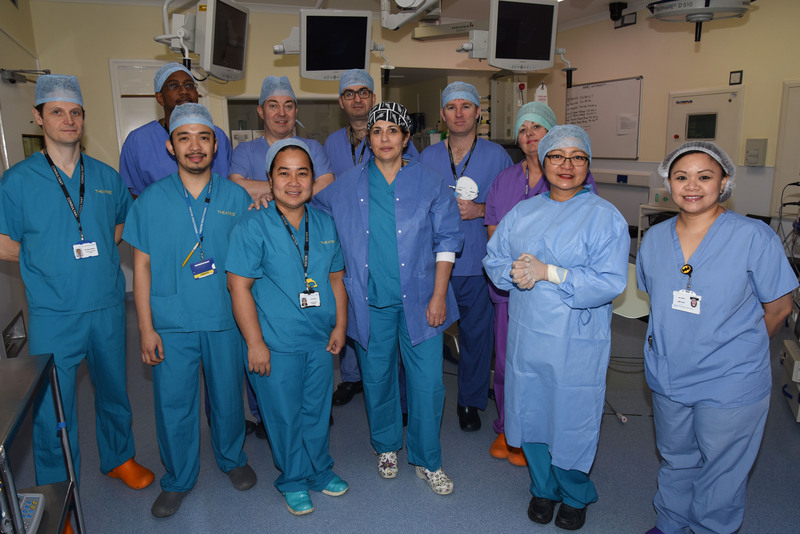 An innovative new treatment for an enlarged prostate called UroLift System, has been used at Eastbourne DGH, one of the first NHS hospitals in Sussex and Kent to carry out the procedure. This new minimally invasive treatment acts like curtain tie-backs to hold open the lobes of an enlarged prostate to create a channel from the bladder. Patients experience rapid symptom relief, recover from the procedure quickly, and return to their normal routines with minimal downtime. An enlarged prostate places pressure on the bladder and urethra (the tube through which urine passes) making it difficult to urinate. It is a very common condition for males over 50. This new UroLift treatment is performed under a short anaesthetic and involves inserting a permanent implant to hold open the prostate. The traditional surgery called a TURP (transurethral resection of the prostate) is a bigger operation and involves cutting away a section of the prostate with a higher risk of side effects and usually a two night stay in hospital. Steve Garnett, Consultant Urologist and Specialty Lead said: “It’s great news for men in this area that we can offer this new procedure. It’s a true breakthrough offering men an alternative to drug therapy or more invasive surgery. “As a Urologist, it’s deeply satisfying to be able to offer men an effective treatment with no risk of sexual dysfunction developing as a result of the treatment. Patients undergoing the procedure will experience rapid symptom relief and recover quickly. Being able to perform this procedure as a day case also means we can perform three times as many procedures allowing us to free up beds for other patients. The UroLift treatment is one of six innovations hand-picked by the UK Government as a strategically important product for the future of the NHS, as one of a handful of revolutionary healthcare technologies that can improve the UK’s public healthcare system, in a new report and funding mechanism for innovations by the UK Government released in October 2016. This entry was posted in News on September 6, 2017 by East Sussex Better Together.